We adapted Objectives and Key Results to create the world’s first IKR! The Objectives and Key Results (OKR) management framework increasing near ubiquity is creating a default “lingua franca” for startup goal setting. Why don’t we use this same or similar goal setting methodology for ideas? There are just so many ways that moment of genius makes it to market from that bar banter to the formalised submission processes on the intranet of every big company and although all of these approaches are beautifully organic none of it seems very integrated with the out-put, and increasingly that means an Objectives and Key Results is involved. To be clear, I don’t mean some vague linkage of a new drop down section in a HR payroll management software (no offence guys!). I mean an integration so tight at an ideological level they’re eating O’Krunchy Nut Cornflakes together in the morning and downing Blue Okra Tequilas together at night. OK let’s rein it in here! Why isn’t there a defined idea creation, feedback and validation process that feeds into OKR? Wouldn’t a process that allows you to put business ideas out there for feedback and validation from colleagues using the same methodology as Objectives and Key Results, just…work? Because surely it’s the idea that is the birth place of the objective. So, without any further ado, ladies and gentlemen please let me introduce you to “Ideas and Key Results” and the world’s first IKR! I’ve heard of OKR but what is “Ideas and Key Results”? IKR stands for “Ideas and Key Results” and allows you and your employees to create and share business Ideas (“I”) with linked proposed Key Results (“ KR”) using the OKR structure and grading system as a basis. And if you’re already smiling at how cheeky this is, or because you already fully understand everything I’m about to tell you. That’s because IKR is just OKR for ideas with one subtle addition, which I’ll get to later. 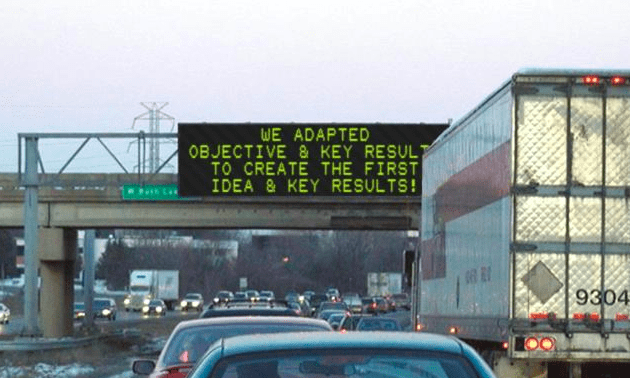 In IKR, like OKR, you have a big idea, which is often a bit fluffy and proposed Key Results which are not and help define and visualise your idea in terms of its execution, difficulty and scale. And in the graphic below you can see the IKR sitting along side your general company OKRs, because the two approaches are fully integrated in ever sense. That’s one of the key benefits. Create the world’s first IKR! And again, below you’ll see a visualisation of a proposed key results and my self grade. Now, just like an OKR, you can self rate your proposed key results from 1-10. You can see in the example below the gradings and the actual IKR at the top! And I’m now ready to push our IKR out into the wild by making visible to all my colleagues by a shared Google doc, intranet or whatever. And it’s all to do with the “0.0” in the above example because unlike OKRs, with IKR your colleagues must grade your idea and the overall averages are used as a first line of defence validation of the idea. So that’s the key difference. Ideas are validated by peer review so if the average grading from my colleagues for my idea is “8.9” you know it’s potentially a good idea. It’s kind of a filtering and ranking system that allows you to more efficiently identify that next big thing manifesting within your company. Now lets get practical, how do use IKR at my very real world startup or business? You can use IKR for you or your employees to propose an idea across your organisation for feedback and validation. And the key difference to classical OKR is that as explained earlier, with IKR, you must get your idea graded by colleagues. This means you and your management can see all the ideas being generated inside your business verified and ranked by average validation score. How. Simple. And. Brilliant. Is. That. 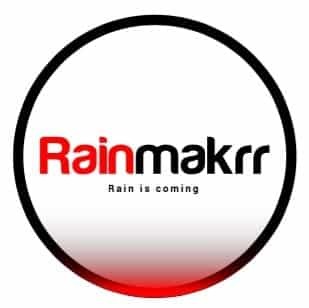 You can use IKR to see the best ideas circulating around your business by, for instance, introducing a watermark that once an IKR gets a 7.5 average rating from at least 10 colleagues it gets a presentation slot at the town hall? – Or on a specific KPI like “Aspirational” or “Just-so-us-ness”? – Or just IKR to pre-screen future quarter OKRs? – Or just to see all the beautiful ideas floating around you and action them faster!? And I’ve just applied OKR to ideas, added one procedural element and given it a smart billy arse name. And you might be entirely right! But I think this is the first time the benefits of such a tight integration between the idea and the execution using OKR and how it works in practice has been explained or defined. If we forget the OKR stuff for a second and think from an ideas to market perspective, IKR is a new integrated and delivery oriented approach suitable for peer review and, with a bit of input, serendipity and real world experience, IKR could get stronger. Maybe it’ll take off, maybe it won’t. But the development of an ideas creation and validation system seamlessly integrated with OKR to aide creative ideas getting to market is worth exploring. And this is my best shot at it so far. An idea, becomes an IKR, becomes an OKR.